A Ghost Town Vampire is a paranormal romance with a western twist, set on the Comstock Lode, in the waning years of Nevada's Silver Rush. The story follows a lawman with a secret, and a spirited tomboy who find herself drawn into the world of the supernatural. 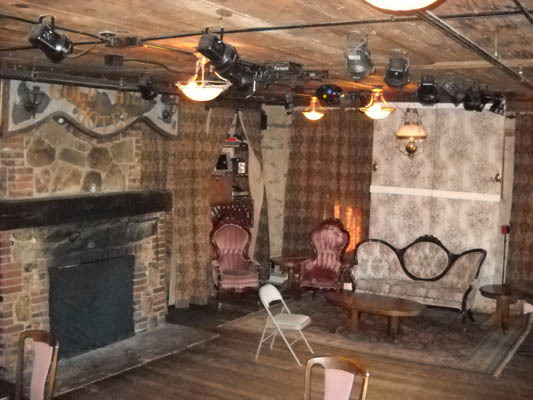 A few days later, I decided to look up the Disneyland Paris haunted house, and found that it was based on a school-house in Virginia City, said to be one of the most haunted places in the West. Months of research online and in libraries followed, and by the time the novel was in its final stages, the Comstock was beginning to seem as familiar as my proverbial backyard. But photos and archives are no substitute for being there, climbing the hills, breathing in the air. I knew I couldn't call myself an honorary Comstocker until I made a pilgrimage to Gold Hill. In August 2010, I had my chance. The Hotel's original brick structure can be seen behind the signposts. 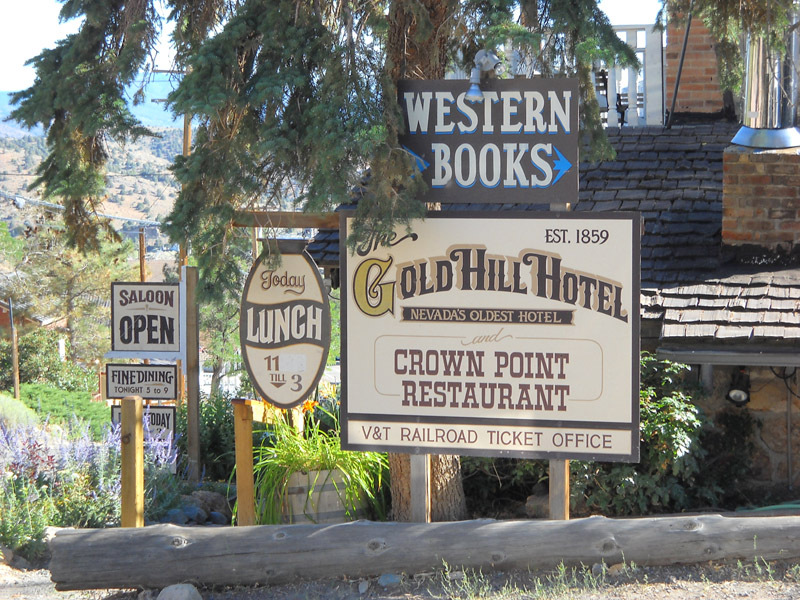 The historic Gold Hill Hotel served as inspiration for my novel’s Canyon Hotel. Like its fictional child, the Gold Hill Hotel is well-known for its supernatural activity, both in two guest rooms, and in the Great Room. I always knew that when I made it to Gold Hill, I would be staying there. I spent a lovely three nights in the hotel’s new addition (no ghosts, but air-conditioning!) 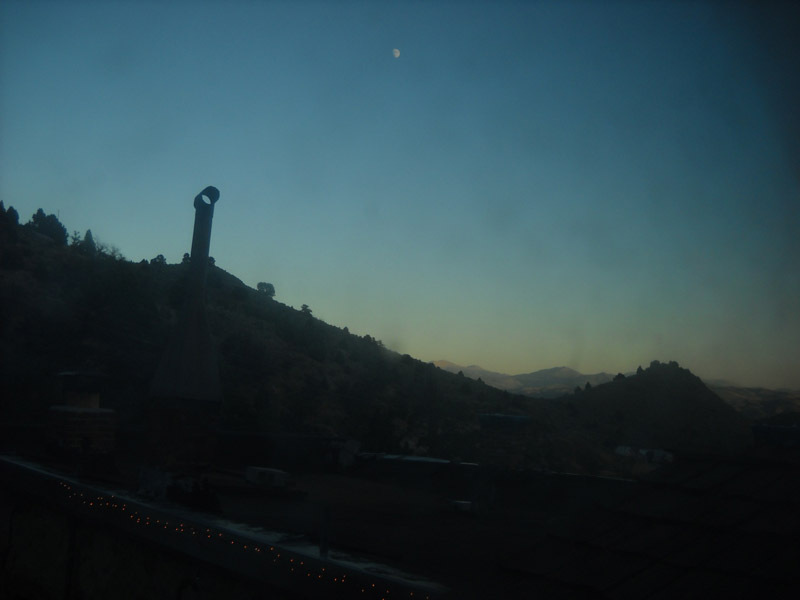 At night I watched the moon rise over the eastern hills. Continental breakfast was held out on the south patio, with a wonderful view of the ruins of the Yellow Jacket Mine. 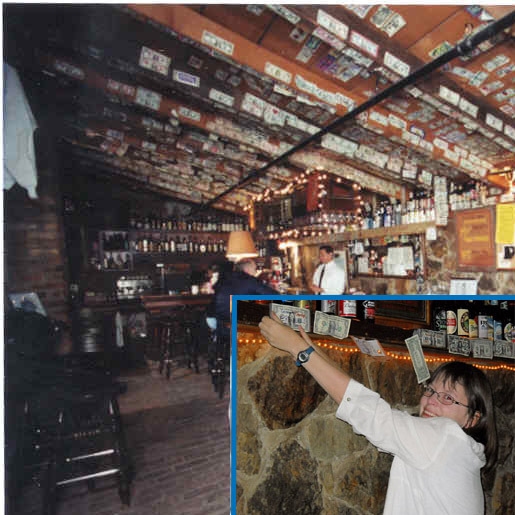 After a long day sightseeing around Virginia City, a drink at the saloon was always welcome, followed by dinner at the Crown Point Restaurant – named after the nearby Crown Point Ravine (since filled in with tailings from open-pit mining. 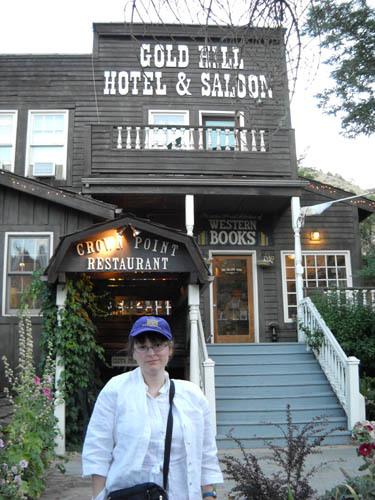 A shopping spree at the Western book store proved invaluable for local ghost stories, Comstock secrets, and Slippery Gulch, an exceptional history of Gold Hill, and currently the only history book devoted exclusively to this fascinating town. The view out Room 11 at dusk. You can see over the roof of the original structure, and beyond the east wall of Gold Canyon. There are perhaps 3 or 4 properties on a hillside that once was home to hundreds of one- and two-room wood houses. Me in front of the modern addition. Any resemblance between the author and something the cat dragged in is directly attributable to 9 hours of sightseeing. I took the general feel of the hotel’s saloon and tripled its size for my Canyon Hotel’s saloon and dining hall. As you can see, visitors like to add their own dollar bill to the scenery. Here I am adding my own in honor of Connor and Charlie. © Jane Senese 2011. All rights reserved.